April in Rwanda is probably one of the most beautiful times of the year. The start of the long rainy season brings forth a burst of green against the canvas of rolling hills. The joy that farmers have from their planted crops that begin to sprout is profound. There is a saying in the U.S. that “April showers bring May flowers” and I believe that it can also apply to Rwanda. Of course, the beginning of April also brings a time of great sadness for the country as they commemorate the anniversary of one of the darkest moments in human history – the start of the genocide that claimed the lives of almost a million people. For an expatriate living in Rwanda, it is one of the moments where you are not sure if you can truly belong to this place. It is an experience that few people can relate to and one where only those who have experienced can truly understand. The songs on the radio change from modern pop music to songs of remembrance for those who lived and those who perished twenty years ago. Billboards throughout the capital of Kigali show the image of a flame, a flame of remembrance. For other expatriates who live in Rwanda, early April is a time to take a holiday since many feel that this is a time for Rwandans and not foreigners. In addition, that first week of April is a time when all restaurants and bars shut their doors, as citizens travel throughout the country to visit their home villages, to conduct public memorials with family and friends. This year, the commemoration ceremony highlights the bringing of a flaming torch – much like the Olympic flame – that has travelled throughout the country and will end with the lighting of the flame at the National Genocide Memorial in Gisozi. The flame will remain lit for 100 days, to mark the time that the violence lasted in this country. Next to the flame is the Memorial Museum, which contains reminders and archives of what occurred here all those years ago. Behind it is a mass grave where over 250,000 bodies are buried. I am always impressed by the memorial and the way it was created to be dignified and respectful place. 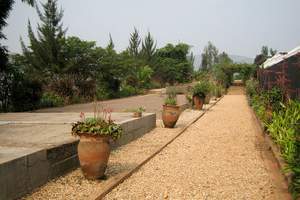 A place that never seems to fail to move the new visitor to Rwanda. I hope this account provides my small contribution to the country I live in. A country that has gone through a very dark past and is still struggling to move beyond it into the light. A country of beautiful green hills and of hard working people. A country that deserves respect for its struggles and accomplishments. This is April in Rwanda.